It's strawberry season here in New York and we've been popping so many of the plump, red berries into our mouths that we're about to turn plump and red ourselves. It's true that in New York you can get strawberries year round but they are imported, expensive and largely flavorless. We don't bother, so when strawberry season arrives, we're all in. A few days ago I converted the remnants of a giant Costco flat of strawberries into an amazingly flavorful sauce which I've been enjoying on my fat free Greek yogurt and anything else I can think of. But I did promise you a strawberry cocktail. There's not a shred of artificial flavor in these drinks and the fresh strawberry flavor comes through loud and clear. If vodka's not your thing, we've also experimented with rum, gin and tequila. You may have to play with the proportions of lime and simple syrup to suit those liquors but the fresh strawberry sauce paired well with all. Cheers! Tear the basil leaves and place them in a cocktail shaker along with the strawberry sauce. Muddle using a muddler or the back of a wooden spoon and then add the rest of the ingredients. Fill the shaker with ice and shake vigorously. 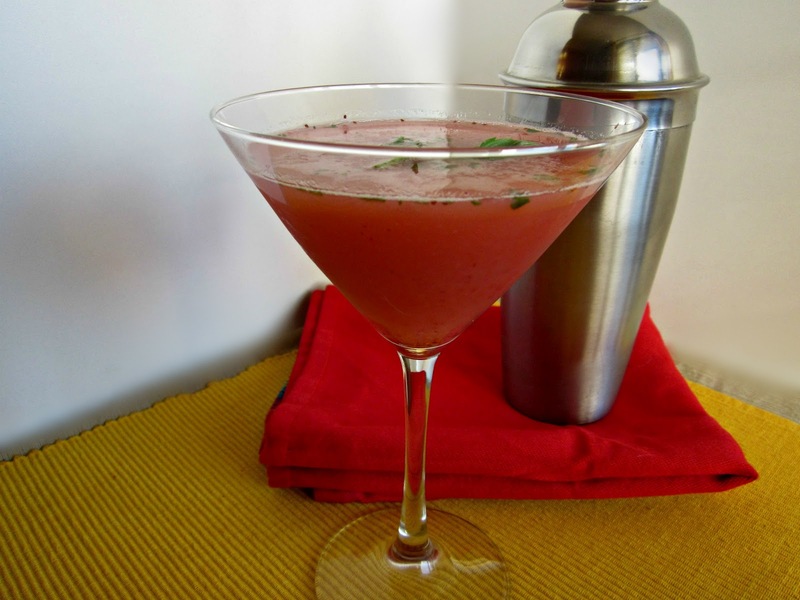 Pour into a chilled martini glass and garnish with fresh basil. Note that, if you've never tried the pairing of strawberries and basil, they go beautifully together but you can substitute fresh mint if you prefer. * To see the strawberry sauce recipe, click here. 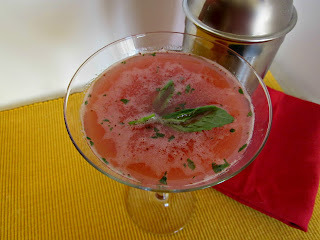 Another wonderful use for that strawberry syrup, love the inclusion of basil-cheers! Enjoy the weekend! I can not wait for strawberry season and for the weather to be warm enough so that I can sit by the pool with this cocktail in my hand.... gorgeous! A serving of fruit AND a cocktail in one! This sounds (and looks) amazing! I am so not a martini drinker, but for this one I'd break that rule. 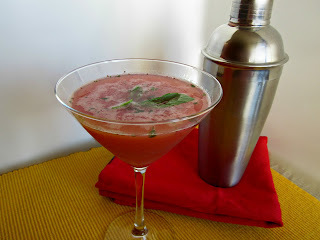 Love the combination of the strawberry and basil to keep it from just turning into another sweet cocktail. Girl if you keep posting all those lovely cocktails I'm gonna have to start drinking. So amazing. Mmmm, I keep seeing strawberry basil combinations that look so good. I will definitely make this! 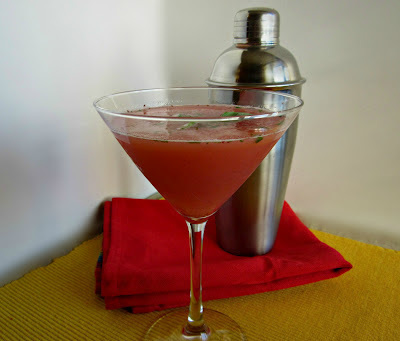 Love the combination of strawberry and basil - popping this gorgeous recipe into my cocktails bible, Anita - cheers! This would be good to serve Mom for her day today. Congratulations on making the foodbuzz Top 9! I love Strawberry Basil Martini's...They are my fave! I actually posted this same drink a long time ago after drinking too many of them at "The House Without A Key" in Hawaii... SOOOOOO GOOOD! Congrats on top 9! Look at you go! Loving this martini! Strawberries and basil are so wonderful together, this screams summer...which I am so ready for! Congrats on the Top 9! This looks so good. Love everything about it! You really make the best drinks! Cheers! Oh, wow! Can we all have a virtual girls night out and have about three of these EACH? ;.))))) I would love to meet you some day. You make the best drinks!!! !